The Southeast Department of Athletics and Mid-America Transplant announced a partnership to bring awareness about organ, eye and tissue donation on Feb. 16. The deal, which runs through 2020, and was made to not only raise awareness about donating, but to also honor those donor recipients and families. April is also designated as the Donate Life month. 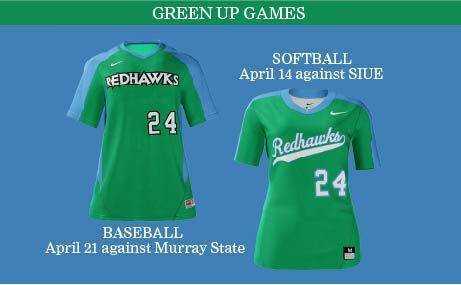 There will be a Green Up game for both baseball and softball, with the baseball game scheduled for April 21 against Murray State, and the softball game April 14 against Southern Illinois University Edwardsville. When Mid-America Transplant approached Southeast about doing an event to raise awareness for the cause, the Department of Athletics was eager to work out a deal. Mid-America Transplant originally proposed simply having the team wear something green , such as socks or a hat. Southeast’s director of athletics Brady Barke had a better idea: he proposed the team wear green jerseys to really draw attention to the cause. The Department of Athletics had somewhat of a history with Mid-America Transplant. In 2012, Southeast soccer player Meg Herndon was killed in a scooter accident. She was a registered organ donor, and her donations went through Mid-America Transplant. Every year, the soccer team hosts a ‘Meg Herndon’ game to honor her and wear green jerseys. This has already been going on, but now that there is a deal with Mid-America Transplant for baseball and softball, it makes the game a little more special. In the United States, 115,000 people are waiting for an organ transplant. In 2017, Mid-America Transplant connected with 223 donors and transplanted 718 organs. The first step for people to help save a life is to sign up for the national registry. This can be done at a license renewal facility, or by going to registerme.org. Donors can be as young as age 1, with parents consent, and as old as 80. Every day, 18 to 22 people die waiting for a transplant. The Department of Athletics and Mid-America are hoping these ‘Green Up’ games will raise awareness in Southeast Missouri and encourage people to sign up to be an organ donor. There will be a registry table at both games in April to promote organ donation and answer questions.